Just like the South Island trip, the North Island was awesome! 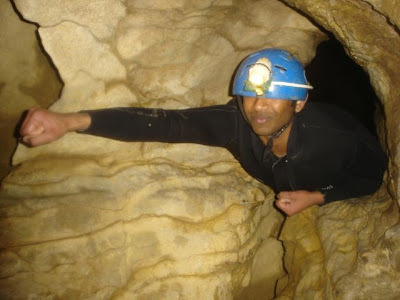 And just like the South Island trip, the North Island trip had only 3 monkeys. We were 2 man short but not 2 short of creativity & fun! We drove around most of the locations in the North Island and had a peak at almost everything. 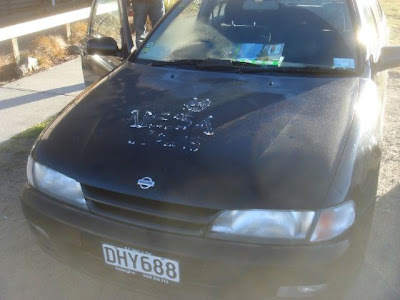 We rented a Nissan Pulsar GTI from NZ-Rent-A-Car for NZ$54 a day (including $10 insurance). The owner of the Wellinton branch is a nice Malaysian Indian man from Seremban. 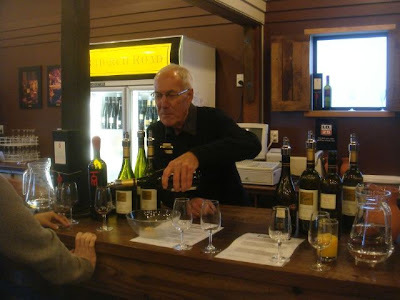 Our highlight for our first day was the Church Road Winery, Napier. 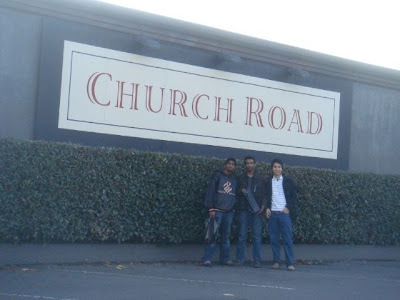 Church Road is one of the well known & popular New Zealand wineries. We signed ourselves up for a winery tour at NZ$10 each. We were shown around the winery & told about the wine making process. We were also told a little bit about the history of Church Road. 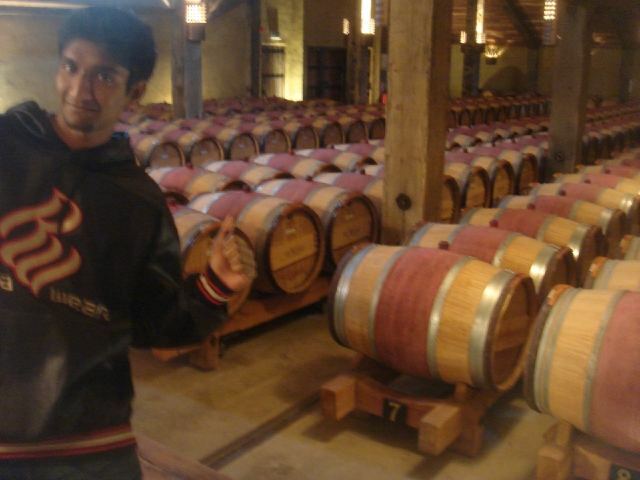 During the tour, we learnt that the wines produced in New Zealand in the year 2007 will be the best ever! So look forward to its release next year! At the end of the tour was a wine tasting session. We were given the opportunity to taste almost every type of wine by Church Road. From Chardonay to Sémillon & standard wines to Reserves, it was a new & interesting experience! At the end of the tour, we were given a 10% discount on the purchace on every wine except the special Tom wine. Our next highlight was the Wai-O-Tapu, 20km from Rotorua. 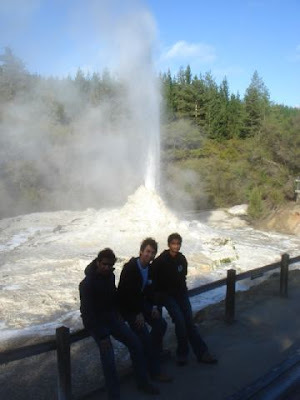 It was the first time I ever saw a geyser erupt! The Lady Knox Geyser is artificially made to erupt at 10:15am every morning by the introduction of soap! Nice! 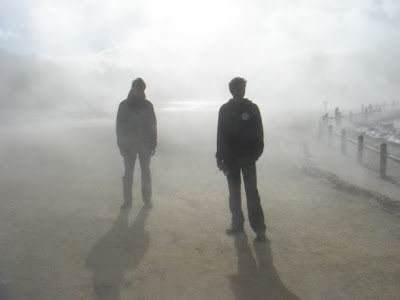 For NZ$25 per Adult we bought tickets to enter the thermal wonderland. The walk was both very interesting & beautiful! There were pools of boiling mud as well as pools of strange coloured water in various combinations of yellow, orange, green & blue. 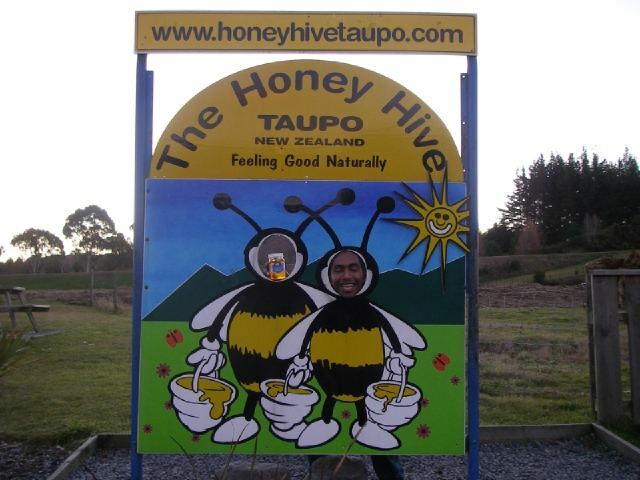 Next was The Honey Hive, Taupo. 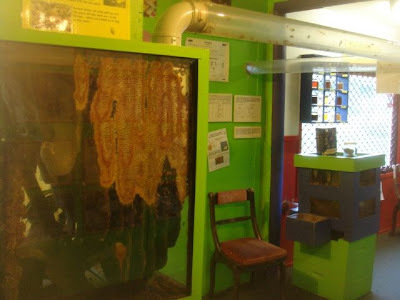 It was a place where we could purchase all sorts of bee related products, like wax & honey. The best part about this place is the authentic & actually functioning bee hive on display. You can see the bees moving in and out of the hive! There is also a free tasting of the many types of honey sold here! Yum! Rata Honey was my favourite. 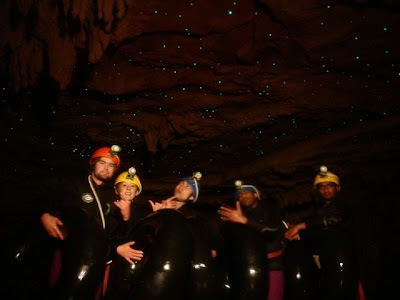 The highlight of our third day was Rap Raft 'n' Rock, Waitomo. 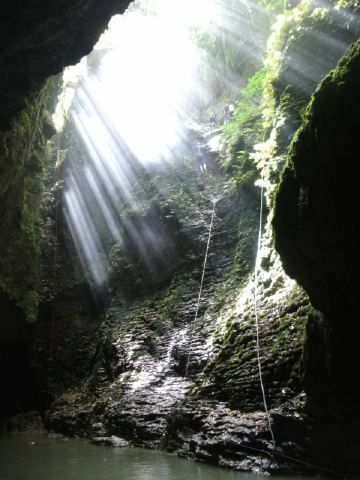 With a young Australian man as our guide, we plunged into the glow-worm caves of Waitomo for a good underground trek. 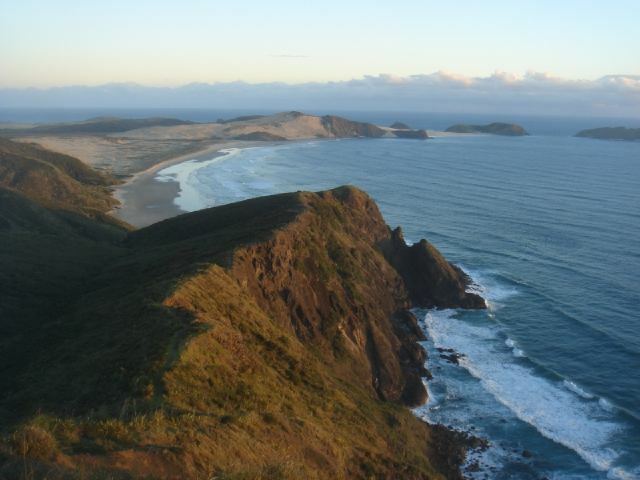 The next highlight is Cape Reinga, the Northernmost tip of New Zealand! The journey there was a horrendous long drive on rough terrain and direct sunlight; but it was well worth it! In Cape Reinga, there is a lighthouse and, similar to the Southernmost tip of NZ, there is a signboard showing the direction and distances of several international landmarks (example: the equator & Tokyo). We arrived at sunset where everything was glowing wonderfully. It is a very beautiful location with views of majestic beaches & sand dunes. We took many picures of landscape and of each other. This is occasion is also marks a significant point of our lives here in NZ. We opened a bottle of Johnny Walker: Green Label we have been saving for such a moment since the beginning of our time in NZ. Checkout a highway of NZ in this video. 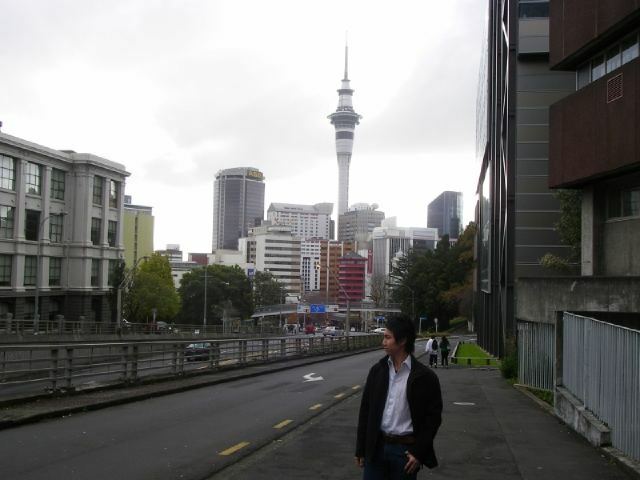 We cut our trip short & spent the rest of our days in Auckland because Guna had an exam. We went into various shops & restaurants. And we saw lots and lots of yellow people. All the while, I was looking out for the highly regarded & well reputed pretty yellow girls of Auckland. There were many well-dressed yellows chicks around the city... but they dissapointed me because they did not have what i was looking for... a pretty & sweet face. A great place for Dim Sum or what is more locally known as "Yum Char" is Great Harbour Chinese Restaurant, located in Auckland central. 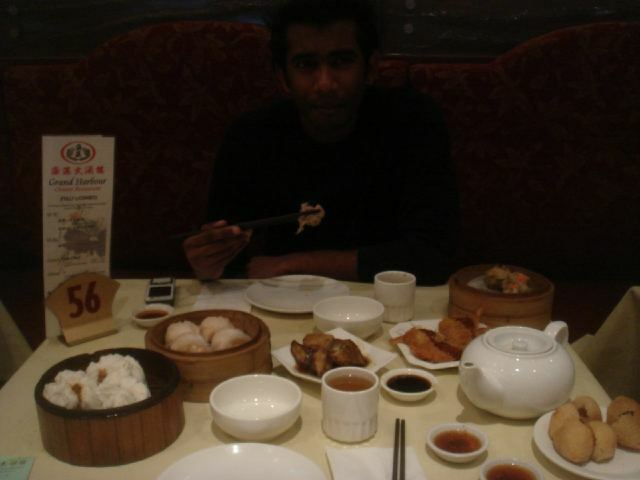 It is a little pricy but the buns, dim sum & dessert are the best I have ever had! A really special place in Auckland for me is the newly opened Ramen Daikoku. 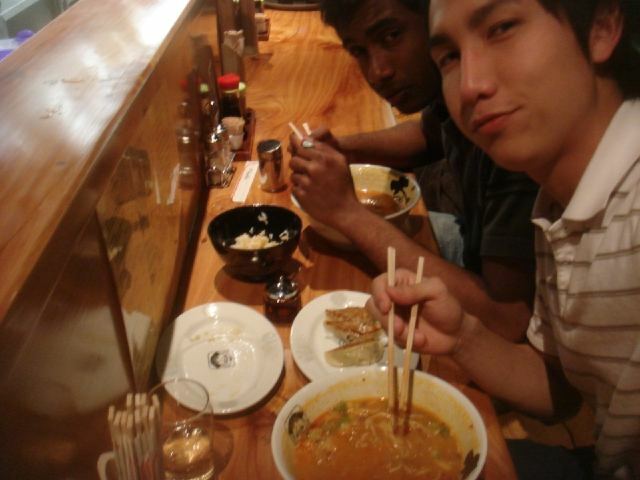 One night, it was chilly and windy in Auckland, that made me hungry for some ramen. Walking on the streets of Auckland central, we went into the first shop with the word ramen in its name. Right after entering this shop, we were greeted by R&B music from a local radio station that only plays that genre & they kept playing our favourites throughout the night... AWESOME! The ramen was good but somehow felt a little overpriced even though it was not pricy. I actually enjoyed the music more than the food & had a greatly pleasurable time largely because of the great music & decor. 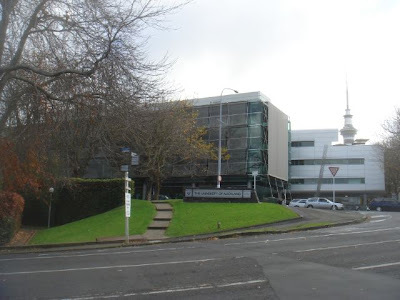 We also visited The University of Auckland. Did not find much to be interested in at the university. Nothing unique about the architecture. It just looked like buildings common to a city, unlike Victoria Universiy of Wellington which is beautifully perched on a hill. However, it is the number one university in NZ & one of the top 50 in the world. Awesome work, Aucks! Here are some things we had to say about the trip. Taken impromptu on Cape Reinga. For me, it was an awesome trip especially because of the time spent with my 2 good friends, Guna & Nesa... Good times.